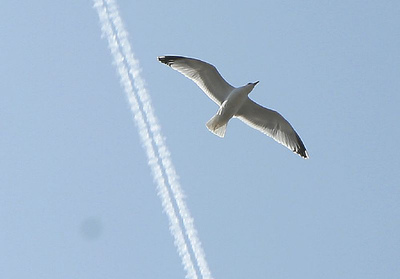 Get involved with "Flight Paths"
The Institute for the Future of the Book is partnering with a host of other literary innovators for a new project: Flight Paths, a networked novel. The initial goal of this project is to create a work of digital fiction, a ‘networked book’, created on and through the internet. The first stage of the project will include a web iteration with, at its heart, this blog, opening up the research process to the outside world, inviting discussion of the large array of issues the project touches on. As well as this, [co-authors] Chris Joseph and Kate Pullinger will create a series of multimedia elements that will illuminate various aspects of the story. This will allow us to invite and encourage user-generated content on this website and any associated sites; we would like to open the project up to allow other writers and artists to contribute texts - both multimedia and more traditional – as well as images, sounds, memories, ideas. At the same time, Kate Pullinger will be writing a print novel that will be a companion piece to the project overall. Read more about how to participate. I'm excited to see another crowdsourced novel starting. From the interviews and research that I did for the "creative crowdwriting" article, many participants in crowdsourced-writing projects had positive, one-of-a-kind creative experiences. They felt invigorated and intellectually challenged, and enjoyed being a part of an online community. Whether you're looking for a serious writing outlet or just want to "play" and contribute on any level, this kind of structure — enabled by Internet technology, blogs and wikis — is ripe for it. If you decide to contribute to Flight Paths, drop a comment and let me know. I'll be following its progress and process with great interest.